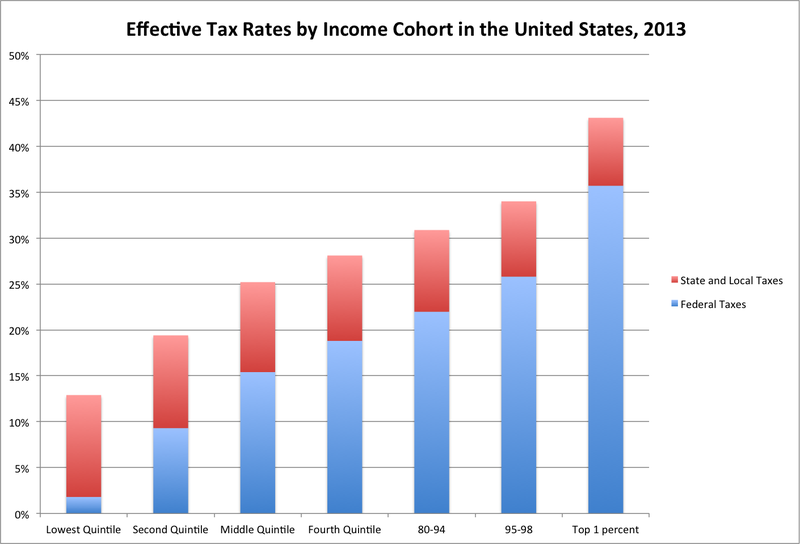 Then HOW do you explain this HUGE difference in the total local, state, and federal effective tax rate? HOW does the top 1% end up paying SUCH a higher total effective tax rate if they shield all their income from taxes, as you so erroneously assert? I'm sure the 1% are very happy you carry water for them. I'm sure they're NOT very happy at having to pay a SIGNIFICANTLY higher effective tax RATE than everyone else. They already earn a lot of money, just taxing them at the SAME effective rate as everyone else would STILL mean they pay way more in taxes than others. For access to the EXACT same government services and benefits. Is someone at least paying you for carrying their water? Shouldn't those who actually DRINK the water WITHOUT paying for it (i.e., society's TAKERS) pay for that? Look at the chart I posted, again. Tell me WHY someone who only pays a 13% total local, state, and federal effective tax rate should get the same government services and benefits as someone whose total local, state, and federal effective tax rate is 43%. Justify that. Last edited by InformedConsent; 11-21-2018 at 02:04 PM..
OR, as is more appropriately illustrated by other countries not governed by the greed factor..."when everyone pays a proportionate amount for it." You, being an American, probably won't be capable of understanding the distinction . And when everyone puts forth a proportionate effort i. e. ... the laziness and greed factor. Greed factor ... demanding something for which you gave nothing of value in return. Laziness factor ... when you don't put forth the effort but expect the same outcome as someone who does. Total nonsense, the wealthy use numerous tax avpoidance schemes as I highlighted, as do numerous companies and especially US companies. That's why the UK names and shames and has black lists now in terms of honours. In terms of the US Trump has given $1.5 Trillion in tax cuts to the wealthy. They were avid readers of Marx and Ingles. Perhaps the OP should try reading Friedrich Engels 1845 work, 'The Condition of the Working Class in England, based on personal observations and research in Manchester. That might give him some idea as to the appaling conditions of the working people which led to the development of what became known as Marxism and later socialism/communism. Try reading the 'Road to Wigan Pier' or 'Down and Out in Paris and London', both by George Orwell or perhaps one of numerous books by Charles Dickens. The average male life expectancy in Liverpool at the time was 26 years old, and poverty, disease, overcrwding, poor working conditions, disgusting slum housing etc were rife in many industralised cities. I just feel some Americans criticise socialism without properly looking to why it came about and not examining the evils of unfettered capitalism. If they were avoiding so much in taxes, as you foolishly assert, their effective tax rate wouldn't be so much higher than everyone else's. THINK! Don't just merely "emote." I am not asserting anything, even the IMF has come out in favour of higher taxes for the rich. Whilst tax evasion by tech, multi-national companies and the gig economy companies is very well documented. What's so surprising that some people want to take other people's money (otherwise known as envy, greed, and theft)? Top 1% earns 19.72% of the income, but pays 37.32% of the federal income tax. Top 5-10% earns 11.37% of the income, but pays 11.24% of the federal income tax. Top 10-25% earns 21.86% of the income, but pays 16.50% of the federal income tax. That's already grossly unfair. Everyone should be paying the same rate. Look at how the 2 groups, the top 5-10% and the top 10-25% are paying income tax shares MUCH more in line with their share of the income.